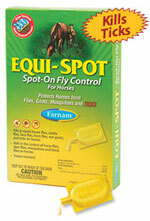 Protects horses from flies, gnats, mosquitoes and TICKS! Premier Spray Marigold Scent is a moisturizing spray that does not coat your horse’s skin or hair. Developed specifically to attract and bind moisture captured from the air to your horse’s skin and coat. 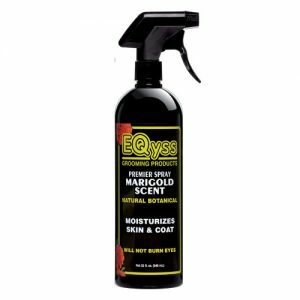 Premier Spray Marigold Scent uses a unique blend of ingredients that adds intense moisture to your horse’s coat, mane, and tail without leaving a slippery residue. Premier Spray Marigold Scent can be used daily, especially after you bathe or brush your horse and is safe to use on the saddle area. Silicone free. Will not burn eyes. For best results, use with Premier Shampoo and Premier Conditioner for maximum, yet gentle, cleaning, color intensifying, and conditioning. For all Horses Ponies Mares Foals. Tropical scent. Multi-use insecticide for control of stable flies, horn flies, face flies, deer flies and other listed insects. For use on horses, cattle, poultry, swine, goats and sheep. Ready-to-use. You can help protect your horse against the threat of West Nile Virus with new Mosquito Halt. 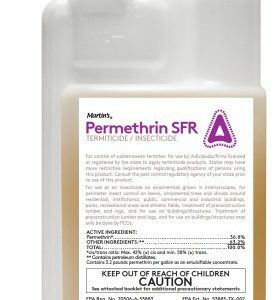 Contains .20% Permethrin and .13% Prallethrin to provide immediate knockdown, kill and residual control of mosquitoes that cause West Nile Virus and other deadly mosquito borne diseases. Dual insecticide and repellent also kills and repels gnats, face flies, stable flies and houseflies. It also includes soothing aloe, lanolin and PABA sunscreen for skin and coat protection. 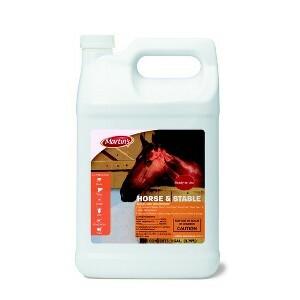 Can be used on horses, foals and ponies. 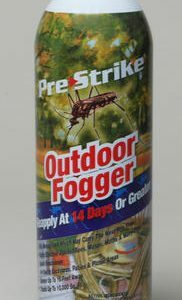 Pre-Strike® Outdoor Fogger – 14 oz. •Treats up to 10,000 sq. ft.
Our water-based formula is quickly becoming a stable favorite among horse owners. It won’t attract dust and grime like oil-based products and offers long-lasting protection against a wide array of insects. Available in 4 oz trail-size, quart, and gallon sizes. 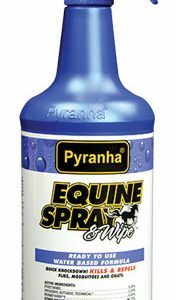 Pyranha Insecticide is an equine aerosol that has been on the market since 1973! This product is citronella scented. Brushing the animal after an application will bring out a bright, lustrous shine. 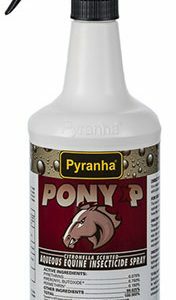 Pyranha Insecticide has been used by champions all over the country for maximum fly control just before entering the show ring. Available in 15 oz aerosol can. 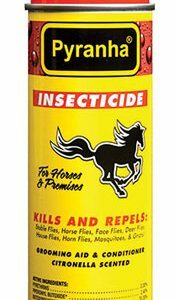 This aqueous equine insecticide spray features a ready-to-use, citronella scented formula. It won’t attract dust and grime like oil-based products and offers protection against a wide array of insects. Pony XP can be wiped or sprayed on horses. This value priced product is sure to be your next favorite. Available in quart size.